13 years after it’s foundation in 1949 Honda Motor Company moved into the production of it’s first S360 micro sports cars in June 1963. A month earlier Soichiro Honda set his Research and Development engineers to work on a 1.5 litre / 91.5 cui 60 ° V12 motor for use in a Formula One application. It would appear that after a deal fell through to work with Lotus the engineers, who had become world champions in Motorcycle Racing, used a 1961 Cooper in their possession as the starting point for an all new RA270 chassis. This gold prototype tested, but never raced, by Jack Brabham in 1964 was notable for a transverse mounted engine and for having 12 exhausts coming straight out of the back. 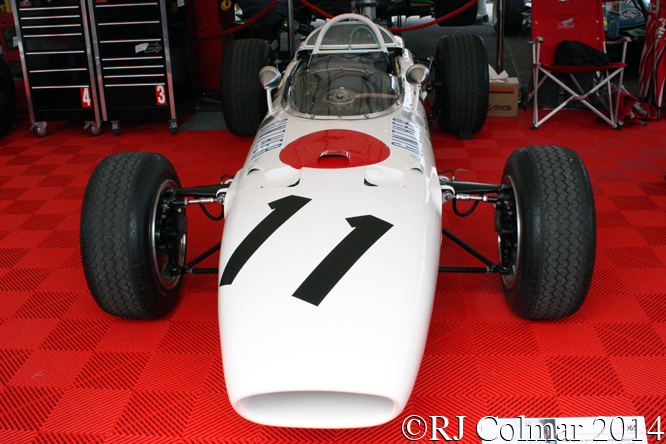 At the 1964 German Grand Prix Honda made their Formula One debut with the RA271 driven by American Ronnie Bucknum, which still had a transverse mounted V12, but conventional exhaust manifolds with two tail pipes. Ronnie qualified 22nd and was classified 13th despite having an accident after completing 11 laps of the scheduled 15 lap race, Ronnie retired from both the Italian and US Grand Prix later in the season. 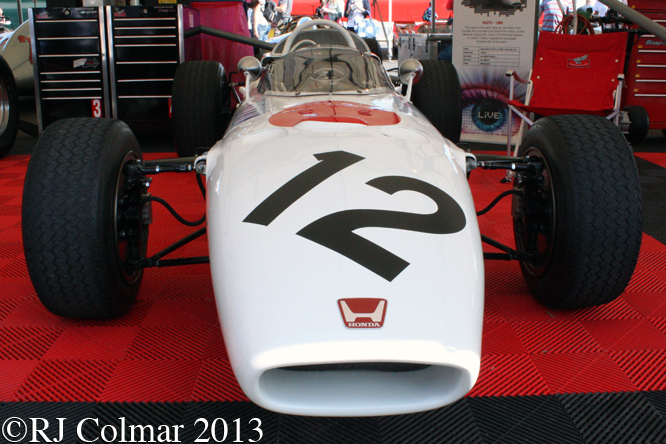 For 1965 the Honda engineers Yoshio Nakamura and Shoichi Sano kept the transverse mounted V12 which was said to produce 230 hp at 13,000 rpm. American BRM refugee Richie Ginther joined Ronnie Bucknum in the team. After the team missed the season opening South African Grand Prix and recording two retirements at Monaco, Richie scored the team’s first World Championship point with a sixth place finish at Belgian Grand Prix after starting 4th on the grid. At the French and British Grand Prix Richie two more retirement and with the team now running just the one car he finished 6th in the Dutch Grand Prix from third on the grid. Honda missed the German Grand Prix but came back with cars for Richie and Ronnie for the remaining three races of the season. Richie finished 14th and 7th in Italian and the United States Grand Prix where Ronnie retired and was classified 13 respectively with both drivers suffering from ignition issues. 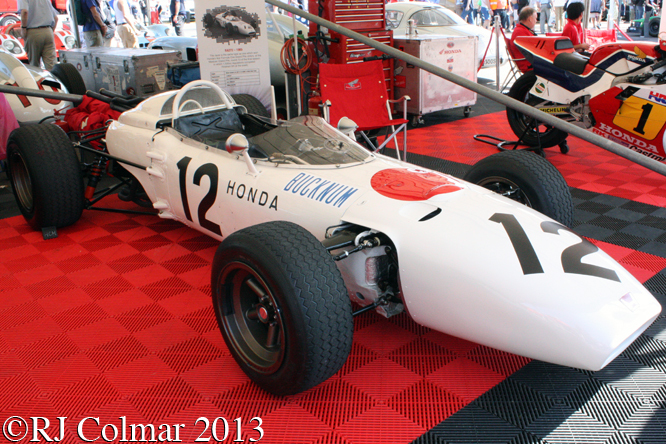 However at the 1965 Mexican Grand Prix, the last of the 1.5 litre / 91.5 cui era it all came good for Honda when Richie qualified 3rd and Ronnie 10th. Against the form of British drivers and British built cars from Lotus and BRM winning the previous nine races of the season Richie came through for the win and Ronnie came home in fifth place. This race would remain Richie’s only victory in Formula One and remarkably the Honda team have added only two more Formula One victories as constructors to that total, at the Italian Grand Prix with John Surtees in 1967 and with Jenson Button in 2006 Hungarian Grand Prix. 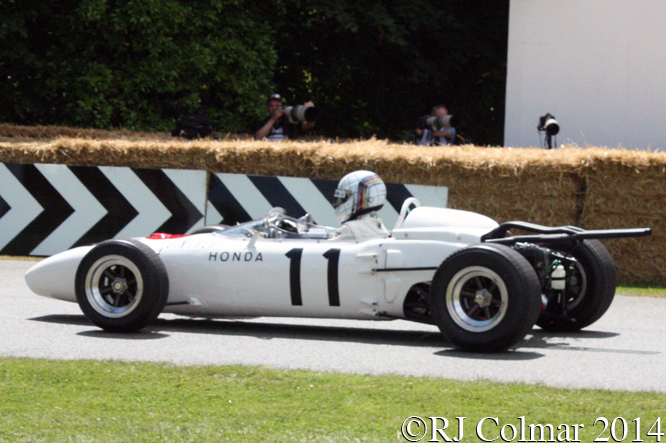 Former Italian Formula One Driver and Honda works world touring car driver Gabriel Tarquini is seen at the the wheel of Richie Ginther’s #11 Mexican Grand Prix winning car at Goodwood Festival of Speed last year. 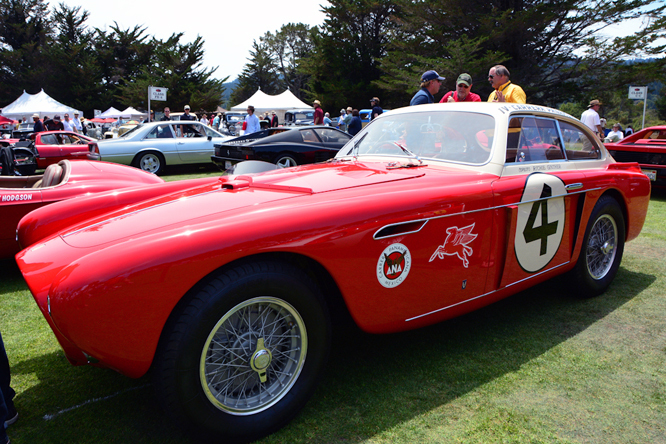 Thanks for joining me on this “Longitudinal Success” edition of “Gettin a li’l psycho on tyres” I hope you will join me again for Maserati Monday tomorrow. Don’t forget to come back now ! 19/04/15 Thanks to Tim Murray for pointing out that the RA 272’s kept the transverse mounted engine layout for 1965. 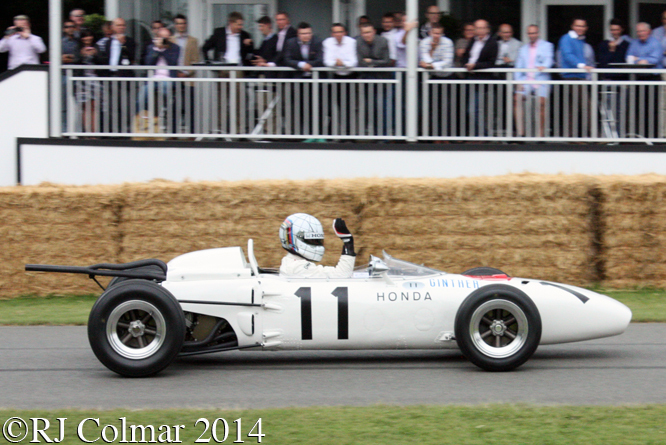 This entry was posted in Uncategorized and tagged Brabham, Bucknum, Button, Colmar, Festival of Speed, Formula One, Ginther, Goodwood, Honda, Nakamura, Psychoontyres, RA272, Ralph, Sano, Surtees, Tarquini on April 19, 2015 by Ralph. Blacksmiths, wheelwrights and coachbuilders Coombs of Guildford was founded in the 19th Century. Descendant of the founders John Coombs was taken to Brooklands before the 1939-45 was and on completion of his apprenticeship in 1949 began motor racing in open wheelers and sportscars with some success. 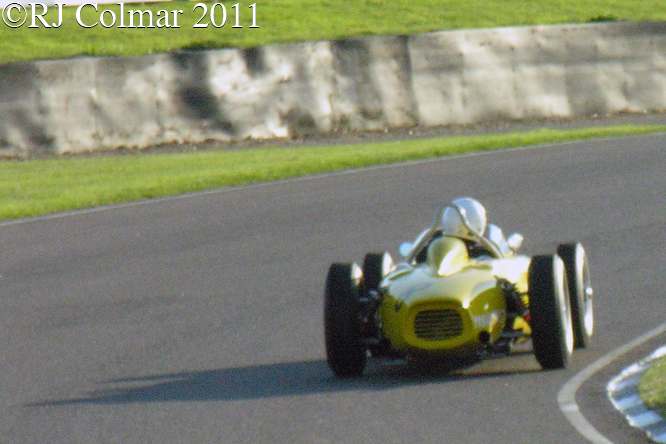 He retired from race driving, after winning two races in a day at Mallory Park, because his business commitments no longer gave him the necessary time to compete, so he made the switch to becoming an entrant. 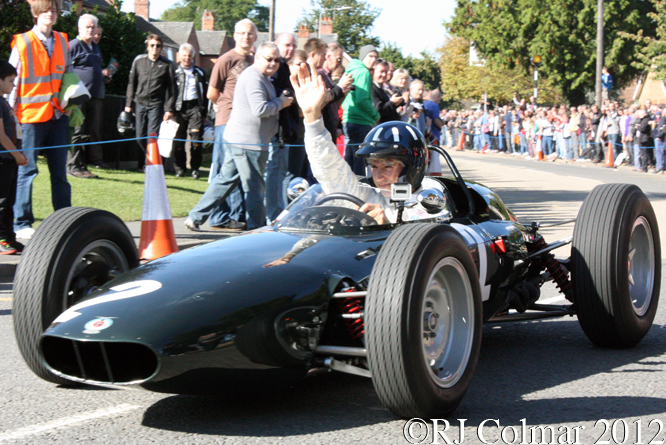 Teaming up with some of the best drivers of the day including his former Connaught team mate Roy Salvadori, BRM driver Ron Flockhart, John built up an excellent reputation with Coopers and Jaguar’s as Coombs of Guildford grew to become a major Jaguar dealership. When he was told Lotus founder Colin Chapman was interested in buying a Jaguar John had no hesitation in putting Colin, against whom he used to race, in one of his cars for a race at Silverstone which Colin promptly won and suitably impressed Colin duly placed his order. In July 1962 John took delivery of a white right hand drive Ferrari 250 GTO chassis #3729GT after it became clear that the Jaguar E-Type was too heavy to compete against Maranello’s finest. 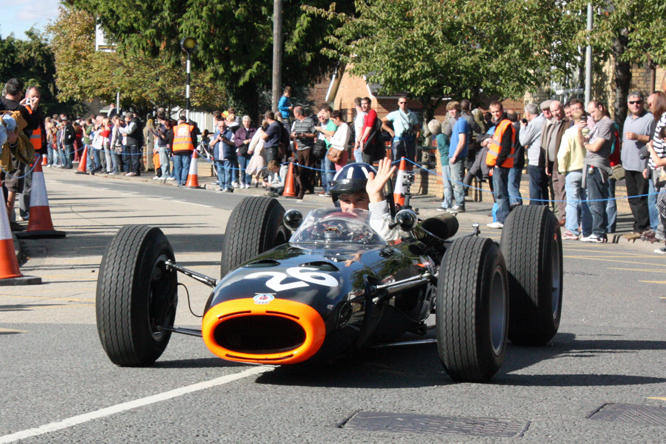 Despite being driven by the likes of Salvadori, Graham Hill and Mike Parkes, all of whom were or went on to compete in Formula One, the car did not record any victories in 1963 but it did record a string of second places. John also sent the car to Coventry where Jaguar made a close inspection of it before building John the first of 11 lightweight E-types with aluminium mononcoques and engine blocks. In 1964 Viscount Eddie Portman took over ownership of #3729GT who added another second place result before it was entered for Ritchie Ginther to drive in the Tourist Trophy run at Goodwood where he finished 9th. JA Pearce of JA Pearce Engineering then used #3729 in a couple of sprints run at Brighton and Blackbushe airport in late 1964 and early 1965. 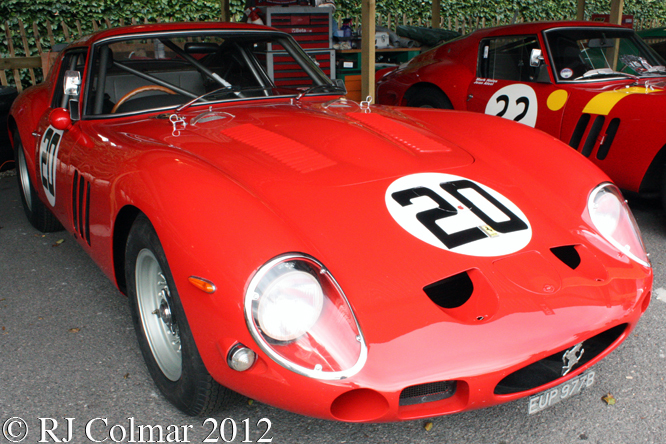 John also known as Jack Pearce spotted the opportunity for building a formula one car for the new 3 litre / 183 cui regulations which became effective from the beginning of 1966 using a 250 GTO motor. 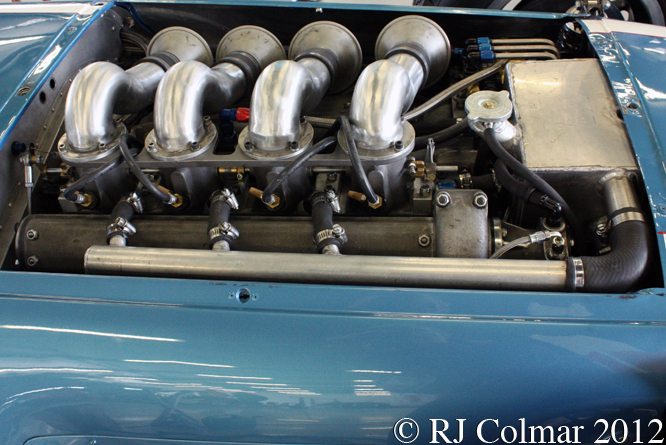 For many years it was believed that the motor from #3729 found it’s way into the back of the JA Pearce 1964 Cooper T73 built originally for the older 1.5 litre / 91.5 cui formula. 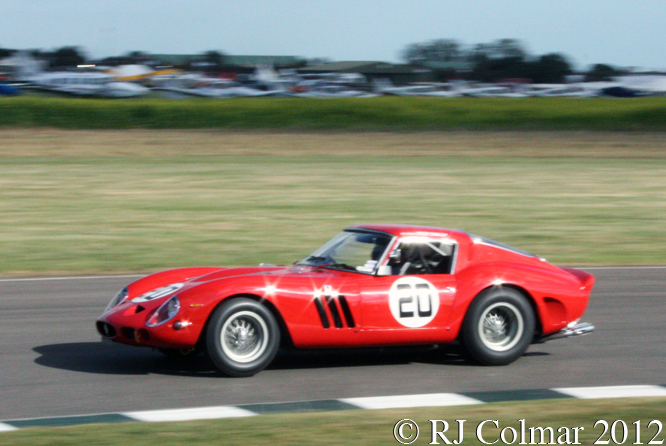 In fact Chris Lawrence, who drove and co owned the Cooper Ferrari, many years later discovered that instead of having a Ferrari 250 GTO motor the Cooper was actually fitted with a on older less powerful motor that came out of Rob Walkers 1961 Ferrari 250 SWB #2735GT which had been driven by Stirling Moss to a string of five race victories. Unfortunately the unique Cooper Ferrari T73 was destroyed in a transporter fire at Silverstone in 1967, although the charred remains of both the motor and car are known to still exist. 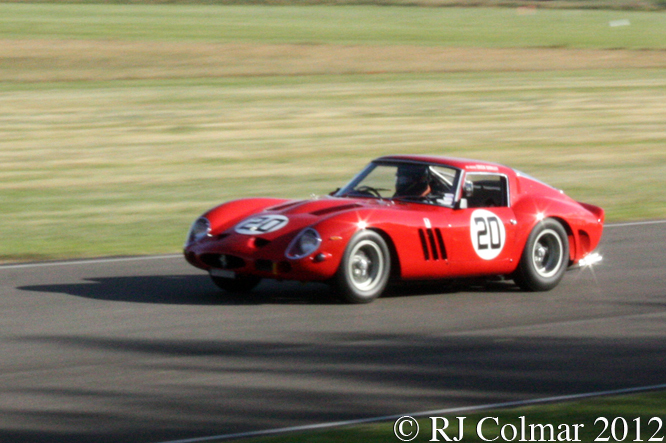 After #3729 had been sold on to noted historic racer Neil Corner in 1966 it was painted red and from 1970 to 1999 it belonged to 1958 and ’63 British Saloon Car Champion Jack Sears, who had raced the #3729 for John Coombs at Brands Hatch and Snetterton in 1963. 1n 1999 current owner Jon Shirley bought the car and had a new engine block installed by Ferrari Classiche nine years later. 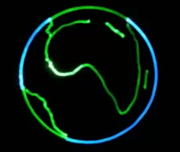 Thanks for joining me on this “The White RHD One” edition of “Gettin’ a li’l psycho on tyres” I hope you will join me again tomorrow. Don’t forget to come back now ! 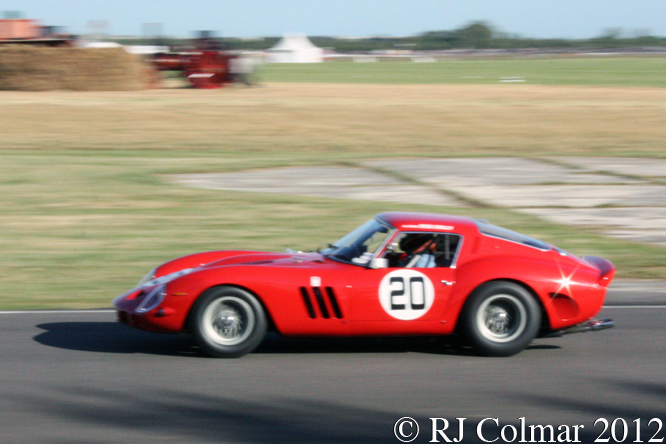 This entry was posted in Uncategorized and tagged 250 GTO, Colmar, Coombs, Corner, Ferrari, GALPOT, Ginther, Goodwood Revival, GT, Hill, Jaguar, Parkes, Pearce, Portman, Ralph, Salvadori, Sears, Shirley, Sports Racing Car on February 7, 2014 by Ralph. The 1961 season ushered in the 1.5 litre / 91.5 cui era of Formula One and only one team was fully prepared for what was to follow, namely Ferrari who had developed a suitable V6 motor for the previous Formula 2 rules. 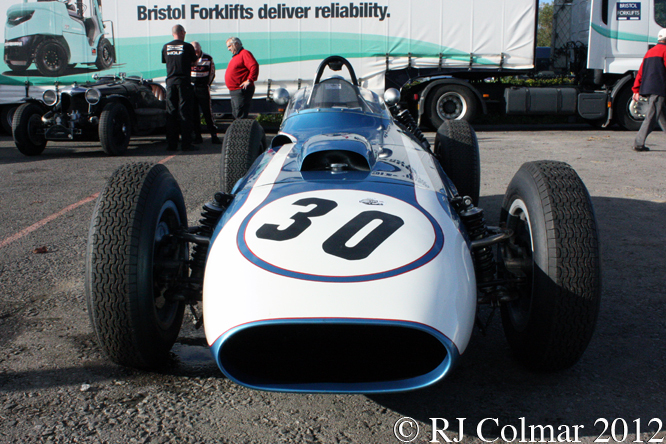 The British manufacturer BRM as usual was behind schedule with it’s V8 motor and so resorted to using the four cylinder Coventry Climax motors that most of the remaining British garagiste entrants were forced to use until the Coventry Climax V8’s became available. Hill won the Belgian Grand Prix and privateer Giancarlo Baghetti driving an FISA entered won the French Grand Prix, coming off a run of two non championship Formula One Victories to make him the only man to win from his first three Formula One race starts. Going into the penultimate race of the championship von Trips lead Phil Hill in points, however despite starting from pole von Trips was involved in an accident with Jim Clark that sent the German’s Ferrari into a collision with a grandstand at the end of the second lap. 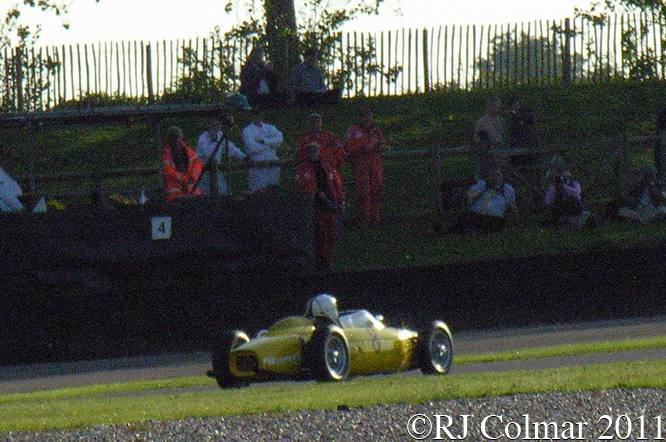 Consequently Von Trips and 15 spectators were killed and Phil Hill who started forth went on to win both the 1961 Italian Grand Prix and the Championship with one race to go. Ferrari withdrew from the US Grand Prix, won by Innes Ireland driving a Lotus Climax 21 to record Team Lotus’s first team victory. At the end of 1961 the 156’s designer Carlo Chitti and team manager Romolo Tavoni walked out on Ferrari to found a new team called ATS, leaving Phil Hill and Baghetti joined by rookies Ricardo Rodriguez and Lorenzo Bandini to soldier on with the 156’s in 1962. The cars remained competitive in the opening races of the season but were eclipsed by both the V8 powered BRM P578 and Lotus 25, driven by Graham Hill and Jim Clark respectively, as the season progressed. 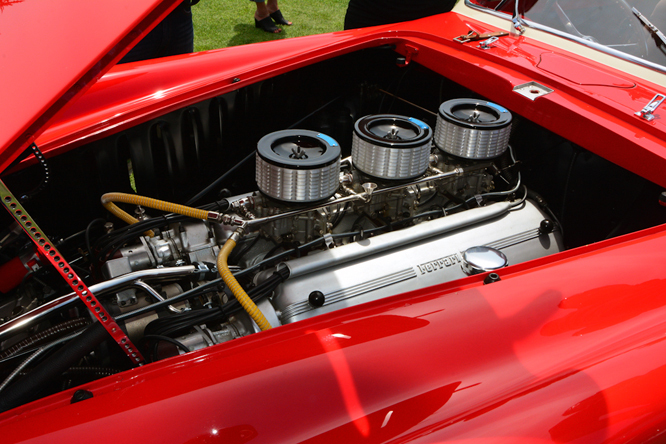 At the end of 1962 Enzo Ferrari had all of the 156’s, known as Sharknoses, broken up with reusable parts saved for future use, while the chassis frames were cut up and used to reinforce a new Ferrari factory floor. For 1963 lighter versions of the 156’s were built in anticipation of a new V8 powered car designed by Mauro “Fury’ Forghieri that John Surtees drove to the 1965 World Drivers Championship Title. The car driven by Jan Biekens featured today replicates the 65° V6 powered chassis #0002 in the colours of Equipe National Belge driven by Olivier Gendebien to a forth place finish with the three 156’s, all using more powerful 120° V6’s of Phil Hill, von Trips and Richie Ginther ahead of him. Von Trips drove the same car painted red at the Monaco Grand Prix where he was classified 4th after crashing on lap 98 of 100. I believe French GP winner Giancarlo Baghetti moved from the FISA to the Scuderia Sant Ambroeus team for the 1961 British Grand Prix at Aintree where he drove the original #0002 still fitted with the 65° V6 qualifying 19th and retiring after an accident having completed 27 laps. At the German Grand Prix Willy Mairesse drove the original repaired #0002 qualifying 13th on the tortuous Nürburgring and crashing out on the 13th of 15 laps. For the Italian Grand Prix at Monza the original #0002 was fitted with the latest 120° V6 and given to Phil Hill who drove it to victory in the race and championship as outlined above. In 2004 Jan undertook the building of this replica with Jim Stokes Workshops Ltd and it was completed some five years later using many original parts, you can see a diary of the work progressing in the ‘News’ pages of Jan’s website. Thanks for joining me on this “Factory Floor Reinforcement” edition of “Gettin’ a li’l psycho on tyres”, I hope you will join me again tomorrow. Don’t forget to come back now ! 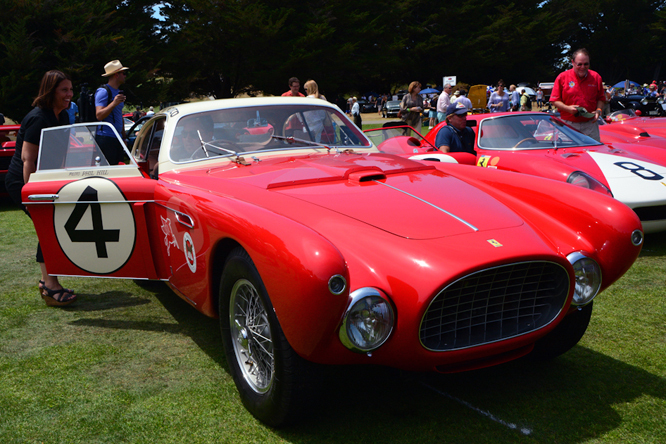 This entry was posted in Uncategorized and tagged 156, Baghetti, Bandini, Biekens, Chitti, Colmar, ENB, Equipe National Belge, Ferrari, FISA, Formula One, GALPOT, Gendebien, Ginther, Goodwood, Hill, Mairesse, Phil, Racing Car, Ralph, Revival, Rodriguez, Sharknose, Stokes, Tavoni, von Trips on July 19, 2013 by Ralph. 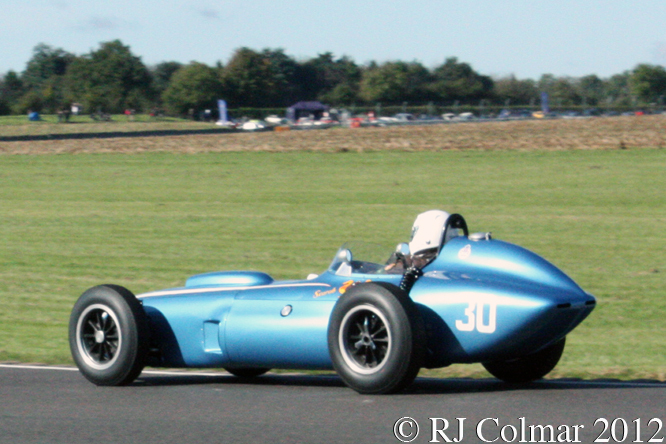 In 1961 BRM were running late with their 1.5 litre 91.5 cui engine program to meet the new Formula One engine regualtions and so came up with an interim design the P48/57 which was powered by a proprietary Coventry Climax engine like most of the British ‘Garagiste’ teams. For 1962 their new V8 was ready and though it was no more powerful than the Coventry Climax the BRM V8 did rev to 11,000 rpm as against only 7,500 for the Climax. The space frame from the 1961 car formed the basis of the ’62 challenger which was known as the P578. 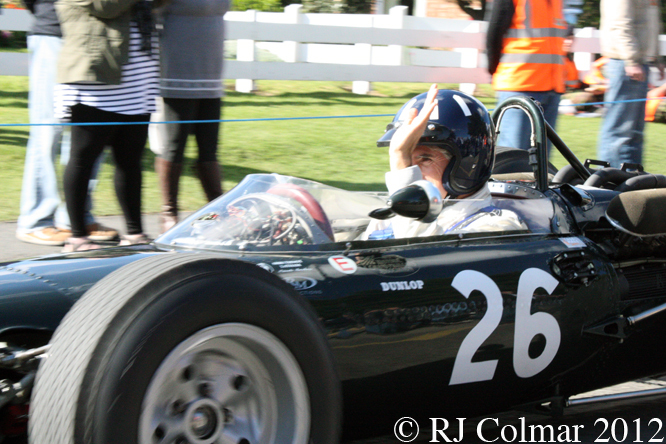 Richie Ginther joined incumbent Graham Hill on the BRM driving strength from ’61 World Champions Ferrari. 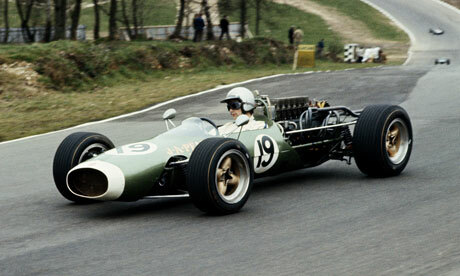 The main challengers for the 1962 World Drivers and Constructors Championships emerged as BRM and Lotus who had introduced a revolutionary new Climax powered car the Lotus 25 which featured a sheet aluminium monocoque chassis in place of the space frame constructed from tubes as was common practice up to that time. First blood in the 1962 season fell to Graham Hill in the Netherlands where Jim Clark finished last of the runners in 9th place 10 laps down in the new Lotus 25. Bruce McLaren won the Monaco Grand Prix in his Cooper Climax, the last win for the marque for three years until 1966. 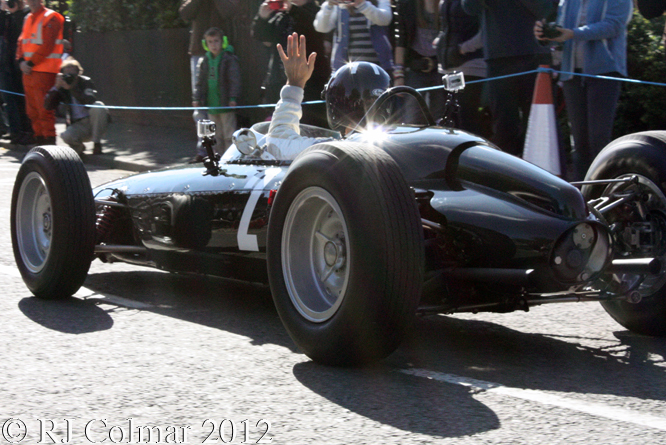 Jim Clark won for the first time in 1962 at the Belgian Grand Prix where he was followed home Graham Hill. 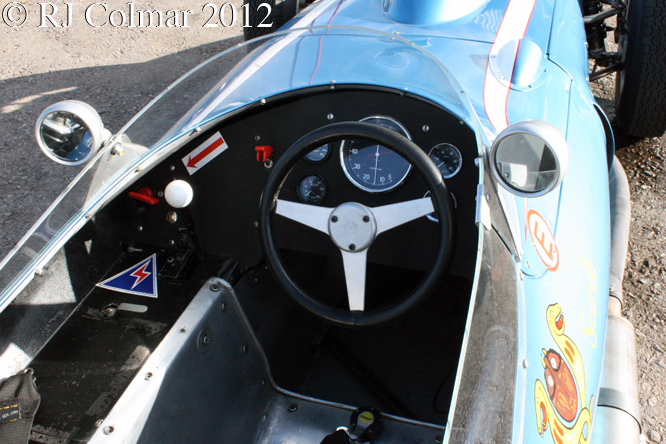 The French Grand Prix saw a fourth different winner in the form of Dan Gurney who was driving a Porsche 804. Jim Clark became the first repeat winner of the ’62 season when he won the British Grand Prix from John Surtees driving a Lola Climax Mk 4. 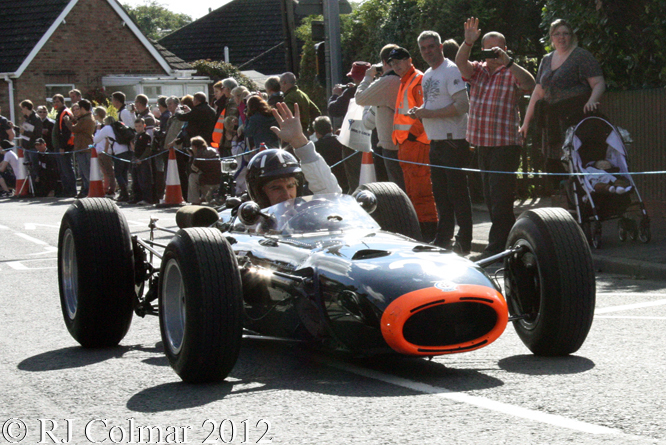 Graham Hill then won the German Grand Prix again from Surtees in the Lola. 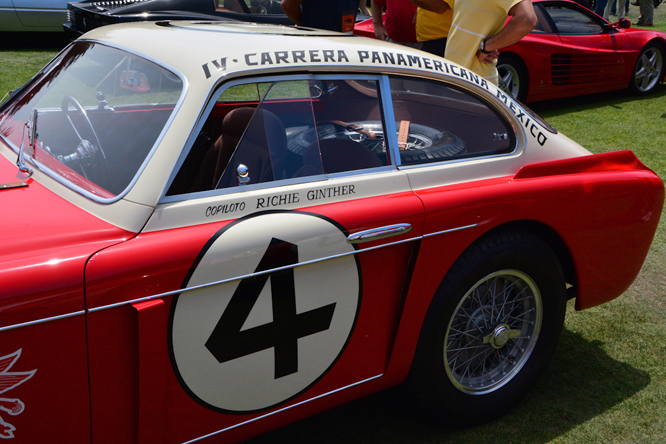 In Italy Graham became the first three time winner in ’62 when he led team mate Ritchie Ginther across the line. At the ’62 US Grand Prix Clark led Hill home by nearly 10 seconds. Going into the last race of the season the superior reliability of the less radical BRM meant that Jim Clarks only opportunity to win the ’62 Championship was to win the South African Grand Prix held in East London. 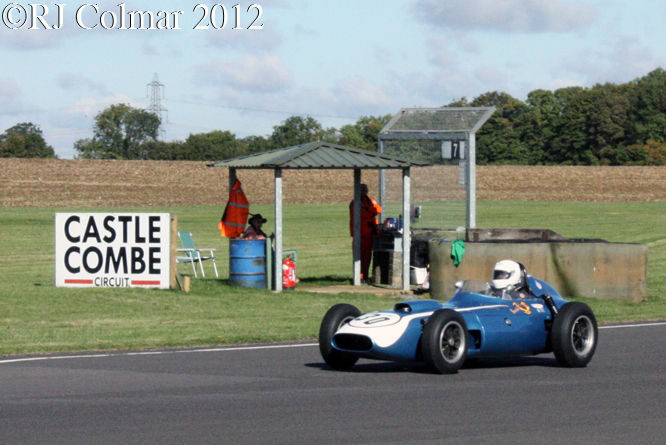 Clark won pole with Hill alongside him and dominated the race until he developed an oil leak with 25 laps to go. Five laps later Clark retired leaving Graham to claim his fourth victory of the season and his first World Drivers Championship. BRM also won their only World Constructors Championship seventeen years after Raymond Mays had founded the team to build a “British World Beater“. 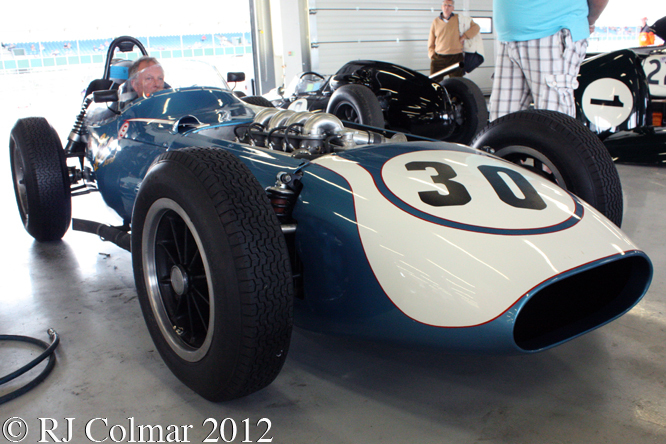 Today’s featured car BRM 578 chassis #P578/1 known as ‘Old Faithful’ was driven for much of the 1962 season by Graham Hill. 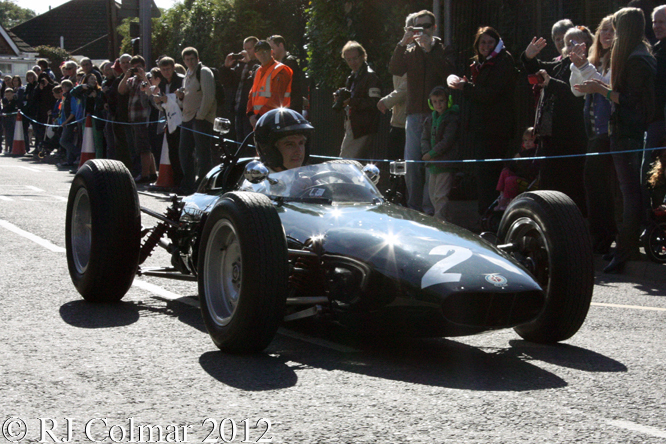 The car which belongs Collier Collection in Florida is seen here at last years BRM Day being driven by Graham’s son 1996 World Drivers Champion Damon Hill. Thanks for joining me on this “Britain’s World Beater” edition of “Gettin’ a li’l psycho on tyres” I hope you will join me again tomorrow. Don’t forget to come back now ! 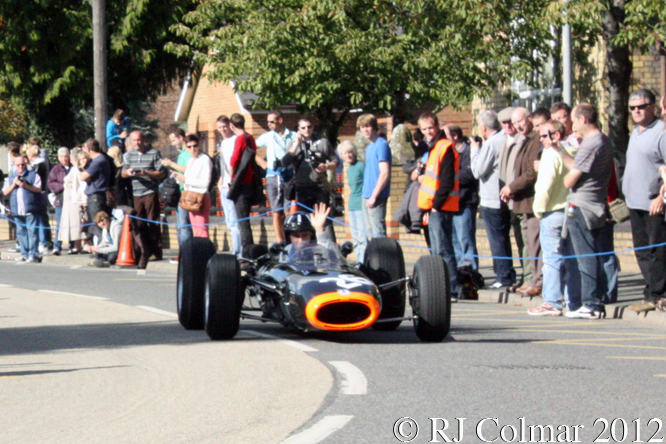 This entry was posted in Uncategorized and tagged BRM, BRM Day, Collier Collection, Colmar, Constructors, Drivers, Formula One, GALPOT, Ginther, Hill, Lincs, Old Faithful, P578, Pride in Bourne, Racing Car, Ralph, World Champion on July 15, 2013 by Ralph. After writing off a Maserati 200S in a sports car race at Snetterton, having been banned from racing in the USA for racing underage, Woolworth heir Lance Reventlow visited Lister and Maserati in 1957 and was appalled by the apparent backward chaos he found at the factories. Determined that he could do better Lance Returned to the United States and founded Reventlow Automobiles Incorporated and initiated a successful sports car program for 1958. Encouraged by his success Reventlow Automobiles Incorporated engaged Troutman & Barnes to design a space framed contender for the highest level of the sport, Formula One. The motor for the new car was designed by Leo Goosens, of Offenhauser fame, who designed a Hilborn fuel injected 2.5 litre / 152 cui 4 cylinder motor with desmodronic, mechanically opened and closed which did away with valve springs, valves as had been favoured by Mercedes Benz during their successful Formula One campaigns from 1954 to 1955. With a wry sense of humour Reventlow deliberately went against the grain of macho exotic names given to racing cars by chosing to call of the cars built by Reventlow Automobiles Incorporated Scarab after a compost beetle. Widely respected for their beauty and build quality the team turned up in Monaco for the start of the World Championship season. Looks were deceiving as the cars proved to be too slow to qualify for the Monaco Grand Prix even after the Goodyear tyres had been replaced with Dunlops, not even Stirling Moss could set a competitive time in a Scarab. Chuck Daigh and Lance Reventlow both qualified for the Dutch Grand Prix however they were both outside the top 15 which meant they did not qualify for start money and so both cars were withdrawn. Reventlow qualified 16th for the Belgian Grand Prix and Daigh 18th however Reventlow retired on the second lap and Daigh on the 17th, both with engine problems. In France Richie Ginther replaced Reventlow in the driving seat and qualified 20th with Daigh 23rd and last however neither started because of engine problems. The team did not appear again until the 1960 US Grand Prix where a single car was entered for Chuck Daigh who qualified 18th. Chuck brought the car home 10th, 5 laps down, on what would be the teams final World Championship appearance. 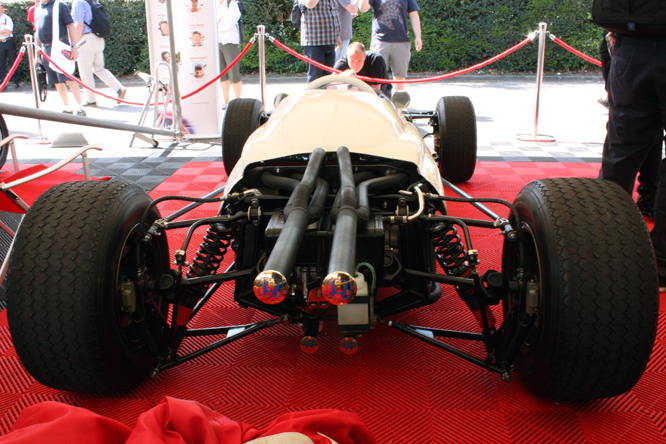 Chassis # 3 seen here was shipped to Europe in 1960 as the teams spare with out a motor. 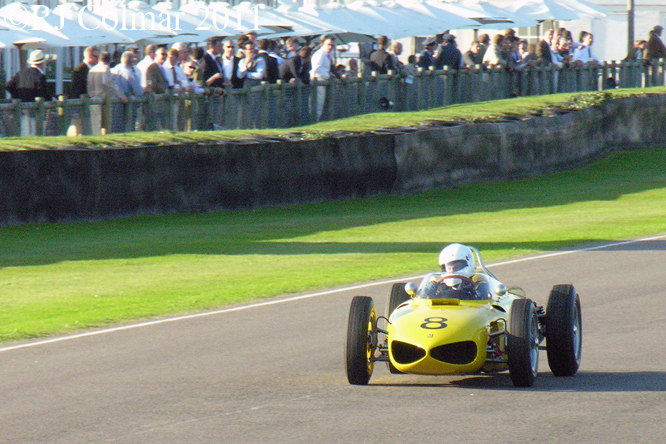 In 1961 Chuck Daigh drove the car fitted with an Offenhauser Indy type motor in the non championship International Trophy at Silvertone and Lavant Cup at Goodwood where he finished 7th and 8th. At the British Empire Trophy Meeting at Silverstone Daigh was badly injured when he crashed the car on what turned out to be the cars final ‘in period’ appearance. 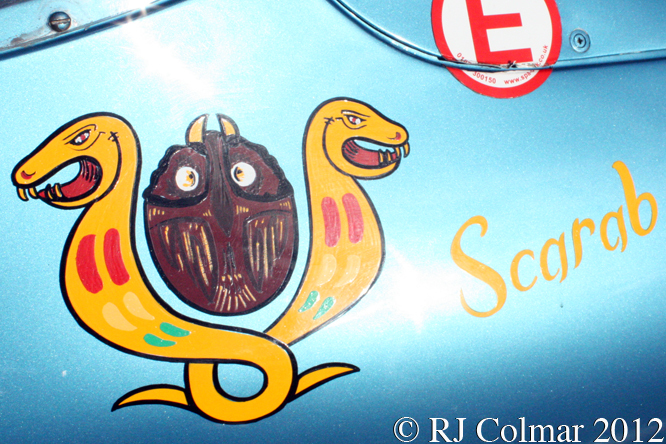 The Scarab had proved to be underpowered and it’s front engined design rendered obsolete by the rear engined designs from Cooper and Lotus and Lance Reventlow had been deceived by the backward chaos he had seen in Europe which disguised much wisdom and craftsmanship gained from decades of experience. 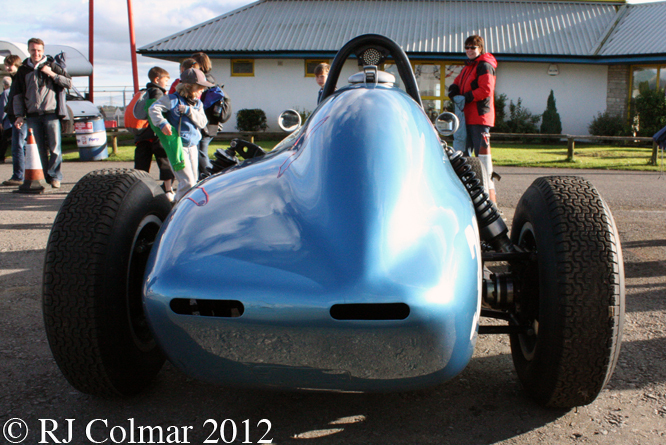 For many years this Scarab was exhibited sans motor at the Donington Park Museum before it was purchased by Julian Bronson who acquired another Offenhauser motor and can be seen demonstrating the car above at Castle Combe. 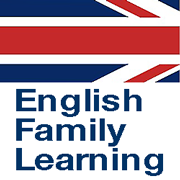 Wishing all my readers from the United States a festive Independence Day. Thanks for joining me on this “American Beauty” edition of “Gettin’ a li’l psycho on tyres”, I hope you will join me again tomorrow. 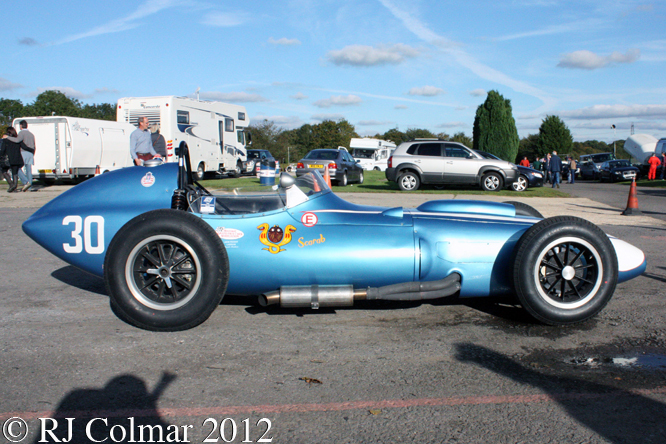 This entry was posted in Uncategorized and tagged Autumn Clasic, Castle Combe, Colmar, Daigh, Formula One, GALPOT, Ginther, Goosens, Hiborn, Independence Day, Moss, Ralph, Reventlow, Reventlow Automobiles Incorporated, Scarab, Silverstone Classic, Troutman & Barnes on July 4, 2013 by Ralph.